Social Media Strategies – lets remember Maslow! 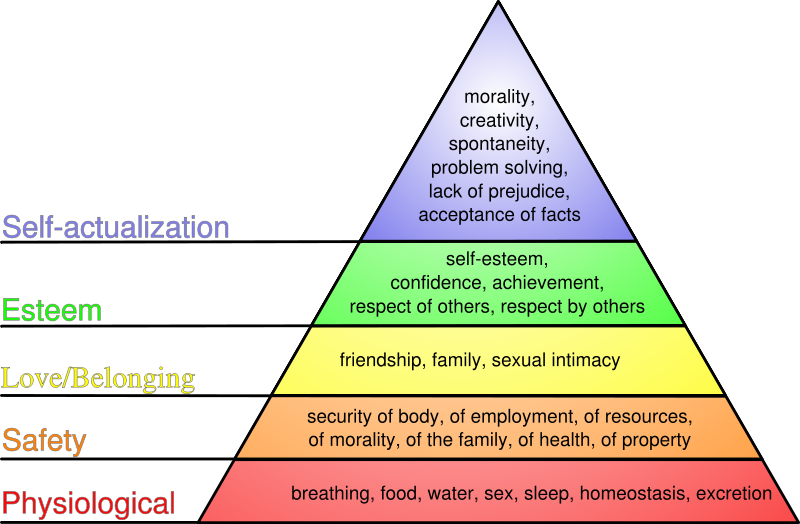 Got this link from Tara Hunt‘s links – a good primer on Maslow’s Hierarchy of Needs Motivational Model originally developed in the 40’s and 50’s with adaptations from the 1970’s (cognitive and aesthetic needs added) and 1990’s (transcendence needs added). Each of us is motivated by needs. Our most basic needs are inborn, having evolved over tens of thousands of years. Abraham Maslow’s Hierarchy of Needs helps to explain how these needs motivate us all. Maslow’s Hierarchy of Needs states that we must satisfy each need in turn, starting with the first, which deals with the most obvious needs for survival itself. Only when the lower order needs of physical and emotional well-being are satisfied are we concerned with the higher order needs of influence and personal development. Conversely, if the things that satisfy our lower order needs are swept away, we are no longer concerned about the maintenance of our higher order needs. In March last year, I recall blogging about a really fantastic appreciation of Maslow and Branding from Jennifer Rice at Brand Mantra, where she had examined in detail the interaction of brands with 8 core ‘consumer’ needs: Security, Connection, Esteem, Control, Aesthetic, Cognitive, Self-Actualization and Transcendence. There is so much potential for social tools and technologies to address so many of these needs – the needs for Esteem, Connection, Self-Actualization, Cognition, Control . Am looking forward to reading Jennifer’s thoughts on how they interact. It would require a cultural change in organizations to acknowledge that some of the more powerful human needs, or in marketing terms, customer drivers, lie in the value of actually passing on the control and freedom to customers. Tied into this need are the needs for connection, esteem, cognitiion, self-actualization and ultimately, transcendence. Web 2.0 companies have shown the way – their products are in perpetual beta, their architecture and marketing is decentralized, they encourage communities of users to self-organize around them. Recently, in an email to Rob, I wrote …. I think one of the most difficult things for people to do is give up control and relinquish ‘power’ to the many unless they see tangible ‘cost-per-click’ sort of gains. It’s the single largest barrier to accepting and adopting a process that is different to one we have been so conditioned to. Sadly, what few realise the act of giving up that power itself can be so empowering for them – why is WordPress gaining popularity – why is Flickr so popular – why are del.icio.us and Skype and so many others gaining traction today? They weren’t built in a day and pushed onto us as a final product or service – they are being built by and around the community that breathes them. The folks behind them had the guts and vision to say – let’s see how our customers ‘play’ – how they self-organize into networks (developers for instance) – embrace the criticisms with the accolades – and build around what they build. Chaos ….. and creativity. So powerful. I’m not one of those academics who is framework-crazy or model-crazy, still it is good to pause sometimes, and reflect on their relevance and application, especially those that deepen our understanding of basic human motivations , which directly affect how we work, play and even ‘consume’. Triggered by the link I discovered today, I’m amazed at how relevant some of these models are, in our understanding and appreciation of the work we are doing in the social media strategy space. So much of our own social media usage that goes to form what Ton refers to as our distributed self, is driven by these needs – del.icio.us, furl, facebook, blogging, flickr, youtube, twitter, plazes, skype, last.fm – the list is never-ending! As I think about each, I see each one fulfilling a different need, and yet coming together to form a lifestream that is driven by the ‘gestalt’, often sub-conscious, of my own needs. Moreover, the ability for brands and organisations to be in beta, and to listen and engage in Social Media – those that can take that leap, will be fulfilling some of the higher-order needs in the classic pyramid model, and in Jennifer’s circle, forming and providing ecosytems to their customers that enable the fulfillment of these needs. Ultimately, good marketing and PR is always one that delivers on meeting customer needs. Something marketers, consultants, techies and geeks, and PR folks who are working in the area of Blogger Relations, Social Media and Web 2.0 should well keep in mind when they design their projects, processes, products or services and strategies!